By Zack Quaintance — The New World #1 is a confident comic, no question. Writer Ales Kot has an impeccable elevator pitch at the heart of this—a second American Civil War has reshaped the global order—and he uses it to play out a number of interesting ideas about where things like television, sports, government, immigration, and law enforcement are currently headed. At a time when so many long-held real world American institutions are in flux (some for wonderful reasons, others less so), the book’s willingness to extrapolate is an incredibly effective hook. Simply put, chances are you will have an interest in one or many of the themes envisioned here. Results are mixed as we proceed through its execution, though, with a clear exception being Tradd and Heather Moore’s artwork, which I found to be nigh-perfect throughout. Everything from character designs, to action sequences, to a reimagined Los Angeles setting, to the book’s lapses into psychedelic bliss—it’s all rendered beautifully with an almost visionary style, one that takes a unique approach to the well-traveled grounds of dystopia. It sounds cliche, but this book really is a joy for the eyeballs. And the rest of the comic—characterization and story elements, specifically—aren’t bad either, not by a longshot. It’s just that the something intangible that makes a story really special was missing for me. This is a tough idea to articulate—I’ve tried in the past—but there’s something off about how this comic feels. It’s all a little too on the noise, although that may be reductive. The book just doesn’t seem to have a coherent worldview, oscillating a bit too fitfully at times between targets of its satire: local law enforcement? sensationalistic TV? xenophobia? political opportunism? there’s a lot of disparate ground covered. 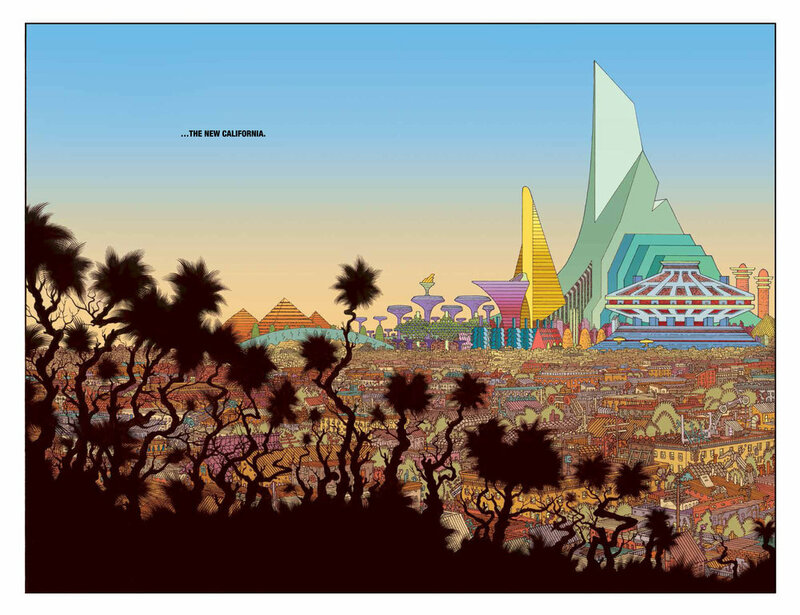 The New World #1's colorful-yet-bleak reimagining of Los Angeles. There's also a slight undercurrent of detached cynicism, both in the characters and their attitudes. Or rather, much time spent on the cusp of cynicism. This perhaps has to do with my own worldview fighting so hard lately to maintain optimism. In other words, results will likely vary, and I don’t fault anyone who is immediately captivated or enthralled by this comic. There’s definitely a scenario wherein the second issue soothes my concerns and I’m back here next month calling The New World #2 one of the most relevant books on the market. Time alone will tell. For now, I strongly recommend this first issue to anyone interested in a solid graphic story about a bleak-but-colorful future America. The art alone is worth it. The New World #1 is out July 25, 2018.